CZ: Hey, could you start us out by sharing with us the one-paragraph description of what Eve Bounty is? 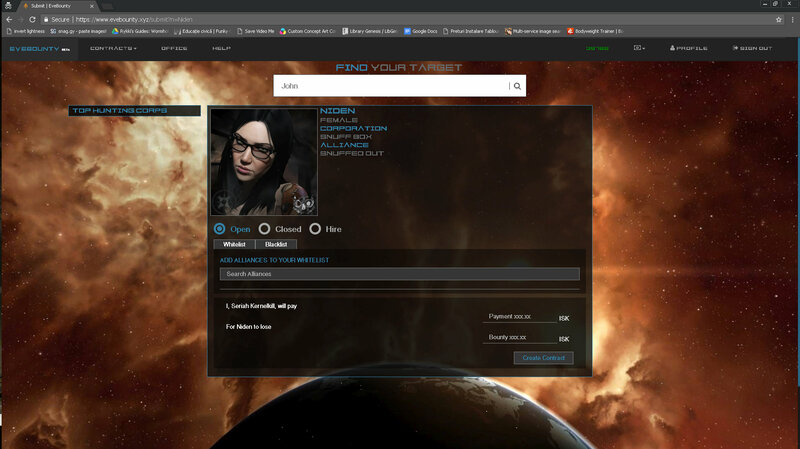 Flame: Eve Bounty is an external application used to spice up the bounty hunting game in EVE Online. It serves as a central hub where pilots can submit contracts on who they want killed. These contracts can be claimed and executed by non-registered and registered users as well as registered corporations. Once completed, a reward is paid out to those involved. CZ: Could you tell us a bit about your in-game and out of game experience? Flame: I started getting into EVE shortly after I heard of World War Bee. One of the first things I did was join a corporation to experience some of the action everyone was telling me about. During my first fleet I flew past a titan, it was then that I knew I was in love with the game. To witness the difference between what I had and what this titan pilot had in comparison was a clear indication of what I could achieve in this game. I am a software developer in real life, starting my post graduate studies in computer science this year. I enjoy working on side projects such as Eve Bounty and a possible indie shooter a few friends and I are creating. CZ: How is Eve Bounty different from the in-game bounty service? How does it compete with, or complement the in-game feature? Flame: The in-game bounty service offer pilots to place a bounty on another pilot’s head. Once killed, that bounty is paid out to the hunter or fleet based on the target’s isk loss. Eve Bounty uses a contract system, where users can submit a contract specifying the amount of isk the target has to lose for the reward to be paid out. This reward is paid out to the hunter who claimed and executed the contract, be it an individual or a corporation. Using this system, it prevents a ‘random’ kill from happening, since the contract has to be accepted before the kill is valid. 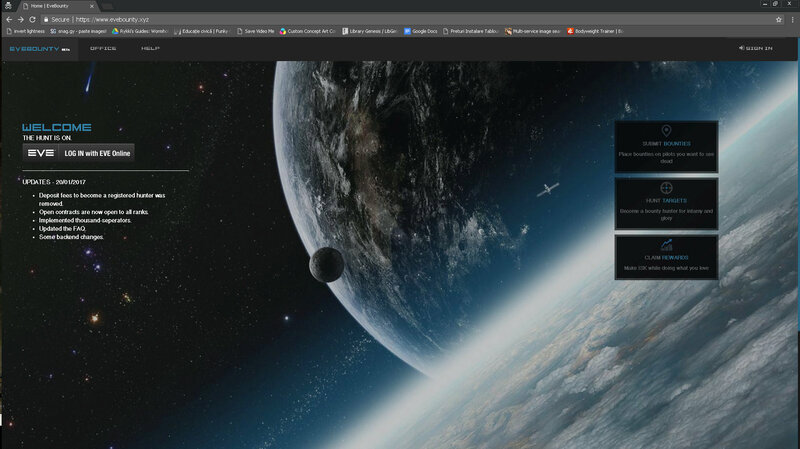 Eve Bounty also allows registration for bounty hunting corporations. Pilots can then hire these corporations to execute a contract. CZ: How do contracts work? Does it take anything in special to create a contract for someone on your service? Flame: Only thing needed to create contracts is money. 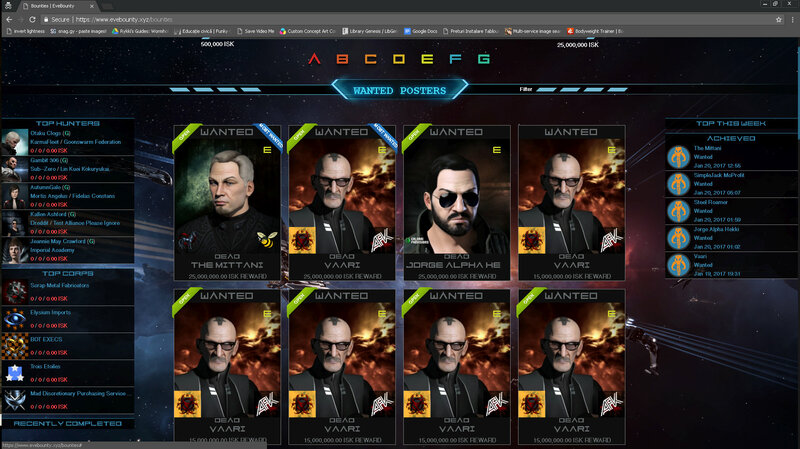 ISK should be sent to the BountyOffice corporation in-game. Once sent, Eve Bounty will automatically allocate the amount into the individual’s Eve Bounty wallet. The pilot can then submit a contract. A pilot can create a contract with multiple rules including a whitelist, blacklist, reward, isk loss and if the contract is open, closed or hired. Once submitted, a rank is allocated to the contract based on the reward. Open contracts can be contributed to by any Eve Bounty user, be it rank or registration status. Closed contracts can only be executed by registered hunters (of the same rank) and corporations. Hired contracts are aimed at hunting corporations. On submission, the pilot can hire one of the registered hunting corporations to execute the contract. Once a contract is claimed by a hunter, kills can be added by killing the target in-game. A hunter has two weeks to add a kill to the contract. If failed to do so, the contract will be removed and resubmitted to the contract pool. A hunter can only have a limited number of active contracts at a time. When the total isk loss is reached, the hunter can claim the reward. CZ: Is it aimed at big-game mercenary corporations or can anyone have a shot at a payday though EveBet? Flame: Eve Bounty is aimed at anyone who wants to do bounty hunting for a living. We do, however, offer a big platform for bounty hunting corporations. Corporations can register on Eve Bounty and receive their own central hub for executing contracts. Pilots can then hire these corporations to execute contracts. CZ: Is there any sort of progression or advancement? Or consequently, any limits on what who can hunt what? Flame: Yes there is. There are seven ranks, A through G. All pilots start of at rank G, working their way up by completing contracts. Hunters can execute contracts with ranks equal to or lower than their current rank. Points are allocated to each contract rank. On completion, these points will be allocated to the hunter. By completing contracts and earning points, hunters work their way up to the highest rank, unlocking the next level of contracts as they go. CZ: Are there any fees for using the service and can it be used without becoming a ‘registered hunter’ with the service? There is a tax on all rewards paid out. However, tax is lowered if a hunter or corporation registers. There is a 15% tax on non-registered hunters, 10% on registered hunters and 5% on registered corporations. This means for each contract completed, a tax of the specified percentage will be subtracted. Eve Bounty can be used without becoming a registered hunter, but is restricted. Non-registered hunters can only contribute to Open contracts and receive a 15% tax on rewards. Thanks for talking to us Flame, and hope our readers give your service a chance.